One Christian said to him, "I know you will kill me, but I give to you my Bible." He started to feel really sick and uneasy about what he was doing. He then began having dreams of this man in white who came to him and said, "You are killing my people." In a later dream, Jesus asked him to follow him and he was now asking to become a follower of Christ and to be discipled. Perhaps this man will be like Saul in the Bible that persecuted Christians and he turned from that persecution to become the Apostle Paul who led it, God can turn it around. Muslims who are converting to Christianity claim to have been compelled to do so after dreaming of a person in white who they believe is Jesus Christ. We may have a new branch of Christianity here. I think that it wouldn't take a lot to massively convert entire muslim nations to christianity or to anything else. That muslims start being sick of it. If ony we had the political will to do so! ...instead of repeating that all the horrors of the jihadis "have nothing to do with islam". This Islam could crumble faster than anyone thinks. But no one dares talk about that. Today on Facebook a friend of mine called me crazy because I asked why palestinians could convert to Judaism since Israel is judaic... Why does it look so crazy? In the past popualtions changed religion as easily as we change shirt. Why should someone keep their religion at any price? Fred, many Palestinians are closet Jews. I showed a video somewhere that went over this. Also, some Palestinians were forced to convert to Islam, Waaaaay back in the 8th, or 9th century, and the families kept a heritage with their Judiams all the time until now. But they couldn't say anything because they would be killed. And they still have to be very careful, so those who have allowed this to come out have had to hide their identity. The reason why so many Muslim converts have to be secretive is because Islam calls for them to be killed for abandoning the Prophet. That's why I have stated that if this rule was lifted today, by tomorrow, at least half of 'so called' Muslims would either quit practicing, or would renounce Islam. It could be more than that. But like I have stated for years, persecution of Christians only makes Christianity grow more. The Romans were the first to learn this and it hasn't changed one bit since then. Quote: In the end, Misinai says, the reintegration of the Palestinians with the Jewish people is the best - and only - solution. "We've been down the path of partition, defensive war and what the world calls occupation. Nothing has worked. The world is getting very tired of our bickering, and is pushing to implement a solution - any solution. So far, the only solutions are the ones that have failed, but here is some new, fresh thinking, that many Jews and Palestinians would accept. And if we accept it, so will the nations of the world." Misinai's Engagement would unite the "two kingdoms of Israel" described by the prophet Ezekiel. "The Jews who went into exile held onto their culture, beliefs and religion, while those that remained behind held as long as they could to the Land of Israel. Both loves - love of Torah and love of land - come from the same wellsprings. It's time to repair the historic damage done by our enemies, the Romans, and reunite our people." My guess is that eventually, when all the conflict is over, a good portion of Palestinians will come out, and the entire land will be called Palestine. But it will be "the State of Israel, in the land of Palestine", as in one title. After all, it would be entirely accurate. This was just sent to me. Quote: WITH SO MANY MUSLIMS FINDING CHRIST, WILL ISLAM FALL? (London, England)—[CBN News] The headlines say Islam is going to be the largest religion in the world. But Islam is facing a crisis. The terrible deeds of ISIS, done in the name of Allah and following the violent example of Muhammed, have horrified Muslims who are now questioning their faith. "If someone leaves Islam and becomes an apostate, he is thrown out of his family; his family will be the first ones to abandon him," Imran explained. "His friends will reject him and he will be killed or he will be persecuted. A lot of my friends said, 'This is the last time I'm talking to you because you disrespected the prophet Mohammed, you disrespected Islam.'" Imram has not yet become a Christian, but has studied the Bible and says Christianity is superior to Islam. Some ex-Muslims become atheists. But some discover a God who loves. In Sweden, Pastor Fouad Rasho of Angered Alliance Church, himself an immigrant from Syria, has baptized more than 100 ex-Muslims. He said because of ISIS, many Muslims are coming to Christ. "Every week I meet one or more persons who come to me and want to know more about Christianity and the Bible because they are very angry about being a Muslim. They don't want to continue to be Muslim," Rasho said. When it comes to religion, Europe has become the new "Dark Continent." And some European Muslims feel trapped between atheism and radical Islam, but some find hope in Christianity. When Nassim Ben Iman came with his parents to Germany as immigrants from a Muslim nation, he remembers thinking that if Germany is a Christian nation, then Christianity is a dead, sinful religion. "So nakedness on the television is because of the Christian religion. Living together not married is because of the Christian religion," Nassim recalled thinking. But then Nassim discovered real Christianity and is today an evangelist reaching Muslims and non-Muslims for Christ. "When the people understand who Jesus is, they will love Him and follow Him more and more. And when the Muslims understand more and more what Mohammed is, what the Koran is, what the history is, then they will go farther and farther away from Islam," he said. The host of an important Christian program reaching Muslims told CBN News, "Islam is going to collapse." Brother Rachid is the son of a Moroccan imam who lived as a secret Christian convert for 15 years. Now he hosts an Arabic language Christian program called "Daring Questions" that challenges Muslims to question their faith. "Many Muslims are saying, 'If ISIS is Islam, I'm leaving.' Some are becoming atheists," Brother Rachid said. "There is a huge wave of atheism in the Arab world right now and many are turning to Jesus Christ. Islam was never faced with this crisis before." Nassim said Islam appears strong, but it is only feeding off the spiritual void in weak Christian nations. "The greatest power of Islam is the weakness of the Christians," he said. "That's what happened in Germany and in America and all the Western countries." Even while it seems Islam seems poised to overtake the West, Brother Rachid says Christians should not fear Islam, a faith he is convinced is slowly dying. "Islam is not God's instrument to judge the West," he said. "I think people are afraid because of what they see on the news. But even violence is just a sign of collapse." I think this is encouraging; however I think it also overlooks the violent reaction that the extreme zealots will likely manifest when they see things going in the opposite direction from what they expect. The present decades of increased terrorism may be seen as the reaction of the zealots to the way that the West completely humiliated Muslim nations militarily in the First and Second Gulf Wars. If the reaction of the Muslim people to this mounting violence and pathological evil is the way it is being reported, then out of desperation, as the extreme zealots see their whole religion collapsing, they may for a time go all-out in the greatest violence they can manage, perhaps even trigger a civil war in Europe. They will of course lose; but millions may die along the way. Just two weeks ago in my church we baptised a lady who had been raised Muslim. She gave a wonderful, very stirring testimony. It was so moving and spiritually insightful, that the pastor let her speak for about 30 minutes after her baptism and being voted into church membership, and then he said he would set aside his own sermon until another day. I'm never going to stop saying that Islam is doomed to fail as a major religion. They cannot reform it, because to do so would automatically mean casting out the Prophet himself. Muhammad's own words, as written, automatically make him a cruel and heartless person. He cannot be reformed, unless everyone has to lie about him. And then he is again doomed. Christ is just the opposite in the he always preached love and forgiveness. And no matter what some of the 'so called' faithful did in his name, the guilt is on their shoulders, not Christ's. There is a world of difference, and exactly why Christianity thrives off of persecution. You cannot defeat it through the use of force. Only complacency and living in a land of plenty can cause backsliding. But eventually that too will fall apart and there is really only one place left to turn in time of spiritual need and forgiveness: Jesus. I just bought a book about the Islamic conversion to Christ story. It's the 3rd one I have. In this latest work("Dreams and Visions, is Jesus awakening the Muslim world" Tom Doyle), he records so many conversion stories and all of them are related to these specific visions. A previous work by a convert, Nabeel Quereshi(now a Christian missionary), included dreams, but, not this one where these folks feel they have seen Christ. His dreams were very important to the process of conversion, but, none were ostensibly about Jesus Himself. Anyway, I posted a long time ago that my missionary friends in Nashville reported years ago Muslim conversions even in Pakistan. It's been ongoing for a generation, Kurdistan has seen some significant Christian growth, Africa does, etc. Guess where lots of the Christian evangelism takes place? In Abu Dhabi. Muslims can come there and hear the Gospel w/o fear. It's a huge "meeting place" for conversions. If you guys knew Islam, you'd understand how close a Muslim is to being a Christian anyway. It really doesn't take that much for them to see the light more accurately, they already believe Jesus is the Messiah. They just disagree about what "Messiah" constitutes. They believe in the virgin birth of Jesus, they say Jesus is "the word and spirit" of God, etc. It's happening according to Tom Doyle more in the last decade than the previous 1400 years. Richard Wurmbrand even wrote of conversions in Iran years and years ago. And in China, President and Communist Party leader Xi Jinping doesn't even realize just how grave a mistake he is making. By alienating Chinese Christians, he is setting up the 'so called' Chinese Communist Party for a major case of civil disobedience. Christians will fight back peacefully, but it will hurt the leaders implicitly. And the more he cracks down on them, the stronger they will become, and the weaker he will be. Very unwise move. And speaking of conversions, I was driving down a street I don't usually travel, here in Cary. And suddenly I saw the very first Messianic synagogue in the Raleigh/Cary area. Sha'arei Shalom Messianic Synagogue. Here's Its facebook page. A few years ago I had done a search and the closest one was in North Durham. There are at least seven "official" Messianic temples in North Carolina, but other "unofficial" ones. I know there is one in Chapel Hill, but it isn't listed. The number of Jews accepting Jesus/Yeshua is growing quickly here, and around the world. I can't say whether or not Messianic Judaism will officially become another sect of Christianity, or another sect of Judaism. Most likely the former, since so many Jews are resisting their acceptance. Only time will tell. Oh, I've picked up more here. This guy is most unhappy about the number of Messianic congregations in North Carolina alone. He puts the number of Messianic temples/congregations at thirty-six. Wow, I had no idea they are growing so fast. “Jewish congregations. Today there are around 140 and that’s not counting all the centers that evangelical Christian missionaries have opened to help Israelis while the Christians that run them, spread their lies about following the Jewish “messiah,” Yehoshua. My heart aches for our people that have become victims of these people and for those who refuse to see the danger it represents to the future of Judaism. Don’t be one of them. find their sites, read their lies and join in the effort to educate Jews about their foes. Be aware, be Jewish! There's a Jewish organization now to resist conversion to Jesus called "Jews for Judaism". They do counter evangelization of Jews. A counter to "Jews for Jesus" which has been around for many decades now. Plenty of websites like the one you posted, too. It's sort of obvious a number of Jews apparently are giving Jesus a good look now days. In the past, I don't think many Jews would even consider Jesus, they seemed to judge Jesus based on historic Gentile Christian anti semitism. I can't say I blame them, but, it is wise for everyone to simply give Jesus a serious look w/o filtering Him through people's conduct. BTW, there's a book written by an Israeli rabbi called "The Return of the Kosher Pig" I read a while back. It is written to Jews. He is a believer and he documents from before Christ till the 20th century that within mainstream Jewish thought, the idea of a Divine Man Messiah has always been there. Most modern rabbis say otherwise, but, he documents that rabbinical thought has always known YHWH would redeem Israel via a God-Man Messiah. Once Jews realize this and see the documentation, they are freed up to really examine the claims of Jesus. The trinity doctrine seems like polytheism to a Jew until they see that there are multiple YHWH's in the Hebrew scriptures. Same character different personalities. I didn't ever see this until I took an OT theology course myself. God is working on the Jews and He is working on the Muslims, IMO. Next up, the eastern pagan religions, He's converting the Chinese as we speak. Looks like the official Atheistic PRC is finally getting uncomfortable with all those multiplying Christians, threatening to take over the country. Now they are starting to crack down, but the millions of Christians are not about to give in, for some reason. In August 2014, a top-ranking official in the Chinese government informed the world that China was planning on nationalizing Christianity. The announcement, unsurprisingly, triggered significant consternation among Christian groups in China and around the globe. Xi Jinping attacks the ‘patriotic’ church that has long co-existed with the government. Its things like this that will eventually bring down the PRC. If nothing else, resistance will be on the increase, especially in light of almost instant world communications. 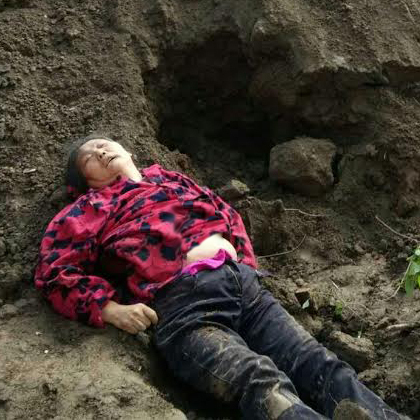 Quote: Two members of a church demolition team in China’s central Henan province buried a house church leader and his wife alive on Thursday when they tried to prevent the destruction of their church. Though the church leader managed to escape, the wife had suffocated to death by the time she was freed. On April 14, a government-backed company dispatched personnel to bulldoze Beitou Church in Zhumadian, Henan province, after a local developer wished to take control of the church’s valuable property. Li Jiangong, the person in charge of the church, and his wife, Ding Cuimei, stepped in front of the machinery in an attempt to stop the demolition. Subsequently, a bulldozer shoved Li and Ding into a pit and covered their bodies with soil. Crying for help, Li was able to dig his way free, but Ding suffocated before she could be rescued. The persecution of unsanctioned Christian churches continues. The former underground churches are growing larger and they are beginning to come out of the closet, and into the open. This shows a shift in both numbers and opportunities. Quote: China, the world’s rising superpower, is experiencing an explosion of faith. The decades of anti-religious campaigns that followed the 1949 communist takeover are giving way to a spiritual transformation—and among the fastest-growing drivers of that transformation are unregistered churches. But those churches wishing government assistance must remove the picture of Jesus and replace it with that of Chairman Xi Jinping. Religion seems to be still very political. They can't make the difference between a cult and politics??? (12-31-2017, 07:33 PM)Fredledingue Wrote: Religion seems to be still very political. They can't make the difference between a cult and politics??? Like all good Statists/Communists, the PRC wants to control everything. Our Progressives want to do the same thing. Unsanctioned churches must be rooted out and put out of business. This one particular church in the article thought they could come out of the basement and build a beautiful church, right out in the open. I guess they thought they could really get away with it, right in front of the authorities.